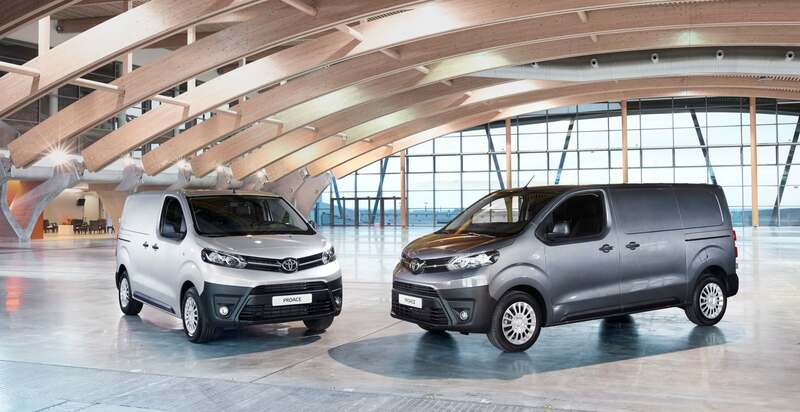 Toyota is extending customer choice and opening up a completely new market proposition with its all-new range of Proace Vans. 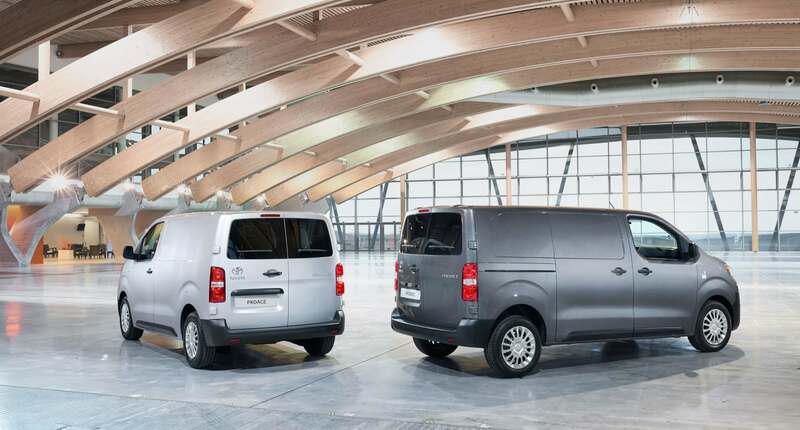 A choice of two grades, three body sizes and two wheelbase lengths are available, together with different body styles that take Proace Van into all areas of the medium duty van (MDV) segment for the first time. The line-up includes the first Proace Van Compact, creating a new proposition in the market by providing the cargo capacity of a medium-size van within the footprint of a compact van (CDV). A combi version seating up to nine and a platform cab ready for conversions will also be available. See the first details on the forthcoming Proace Verso MPV here. Five diesel engines are available, according to market, with power outputs from 94 to 178bhp and a choice of manual, robotised manual and automatic transmissions. Specification highlights include optional power sliding side doors, three front seats (including Compact) and a new Smart Cargo system that features an opening bulkhead and lifting front passenger seat base to increase load length capacity by 1.16m and overall load volume by an extra half a cubic metre. Safety standards have been further increased. Proace Van has a top five-star Euro NCAP crash test rating and will be offered with the option of two Toyota Safety Sense packages providing a choice of active safety and driver assistance features. The all-new Toyota Proace Van range of light commercial vehicles will make its world debut at the Commercial Vehicle Show at the NEC in Birmingham from 26 to 28 April. It will be well-placed to take advantage of the strong recovery in the European LCV market in recent years, with sales volumes rising by more than 12 per cent in 2015. Toyota expects sales to reach 2.2 million in 2016. MDVs account for around 28 per cent of sales, approximately 640,000 units. UK order books will open in late April, ahead of the official start of sales in September. Prices and specifications will be announced soon. Proace Van’s strong new frontal design clearly marks it out as a member of the contemporary Toyota family. It will be available in a choice of three body sizes: Compact, Medium and Long. The Compact will be the shortest model in the MDV segment – shorter even than some CDV models – measuring 4.6m long with a 2.9m wheelbase. Its 11.3-metre turning circle makes it highly manoeuvrable for use in built-up areas. Proace Van Compact is available in panel, semi-glazed and glazed versions. It has three front seats and its cargo bay measures 2.1m long by 1.6m wide, giving a load volume of 4.6m3. The new Smart Cargo system, combining an opening front bulkhead with a lifting front passenger seat base, increases the maximum load length from 2.5 to 3.7m and total load volume to a best-in-class 5.1m3. Available on all Proace Van models (option or standard according to grade), it also includes a storage compartment beneath the central passenger seat and an adjustable desk/worktop function built into central seatback, complete with a swivelling shelf with a high-grip tray to securely hold items such as laptops and documents. The Medium version is 4.9m long and has a 3.2m wheelbase. When the Smart Cargo system is fitted, overall load length extends to 3.7m and load capacity rises from 5.3 to 5.8m3. The medium-length Proace Van is available in panel, semi-glazed, glazed, crew cab, combi and platform cab versions. The Long version of Proace Van has the same 3.2m wheelbase, but with an extended rear overhang that takes overall vehicle length to 5.3m. Panel, semi-glazed, glazed, crew cab and Combi versions are offered. The cargo area measures 2.8m long and 1.6m wide, giving a load volume of 6.1m3. Here the Smart Cargo system takes maximum load length to 4m, increasing load capacity to 6.6m3. With each vehicle length, Proace Van benefits from left and right side sliding doors and side-hinged rear double doors that open to 180 degrees. The vehicle width and height are standard at 2.2m and 1.9m respectively. Maximum payload is up to 1,400kg and the braked trailer towing capacity is up to 2,500kg. The cabin is robust, functional and spacious, designed to meet the needs of both commercial and private owners. The dashboard features clear instrumentation and analogue dials with ergonomic switchgear. The driving position affords excellent visibility and is car-like in its position, with a short-throw gear lever mounted close to the steering wheel. Proace Van is available in three equipment grades: Base and Comfort for the van and Combi for the passenger version. These complement the Proace Verso passenger car, which Toyota revealed at the Geneva motor show at the beginning of March. The entry-level, commuter specification Combi provides practicality and durability with low ownership costs. It is available with a choice of cabin configurations with five to nine seats. The former features twin “captain’s chair” style front seats and second or second and third row benches; the latter uses two or three tiers of bench seating. The standard specification for Combi and Base models includes three front seats, driver’s seat armrest, driver and passenger front airbags, cloth upholstery, central locking, cruise control with speed limiter, 12V dashboard power outlet and 16-inch steel wheels. Comfort grade (for van and crew cab models) adds more sophisticated cabin acoustic treatments, driver’s seat height adjustment, combination cloth and vinyl upholstery, stereo radio with Bluetooth and USB port, air conditioning, cooled and illuminated glovebox, remote central locking, additional 12V power outlets in the glovebox and cargo area and the Smart Cargo system. There is a wealth of options and accessories for owners to adapt their Proace Van to suit their needs. For ease of use, keyless entry, automatic headlights and wipers, front and rear parking sensors and a rear-view camera are available. Performance can be adapted with increased payload, higher ground clearance and off-road capabilities. For more style, customers can add 17-inch alloy wheels and colour-matched side protection, doorhandles and door mirrors. For added safety, Toyota offers side airbags, bi-xenon headlamps and fog lamps. Two Toyota Safety Sense packages are available: the first provides Lane Departure Alert, Road Sign Assist, Driver Attention Alert and an Automatic High Beam system; the second pack adds Forward Collision Warning, Adaptive Cruise Control, Autonomous Emergency Braking with pedestrian detection and cornering lights. To make it easier to access rough off-road locations such as building sites, Proace Van can be specified with its ground clearance raised by 25mm and Toyota Traction Select, which adapts the vehicle’s traction control to provide better performance on uneven, low-grip surfaces. As well as the standard, switchable electronic stability programme, the system has three operating modes: for snow (active up to about 30mph), mud (up to about 50mph) and sand (up to 75mph). Accessories include extra acoustic and thermal insulation, a rear ladder, fixed and fold-out tow hooks, roof rack system with rollers, top boxes and pipe carriers and a range of tailor-made items supplied by Würth. The new Proace Van is available with 1.6 and 2.0-litre diesel engines with a range of power outputs and choice of different transmissions. The model is targeting best-in-class CO2 emissions for a medium duty van, supported by the use of Toyota’s Stop & Start system. A 94bhp (70kW) version of the 1.6 unit can be matched to either a five-speed manual gearbox (with 210Nm of torque), or a six-speed robotised manual transmission (240Nm of torque). The former generates CO2 emissions of between 144 and 148g/km with combined cycle fuel economy of between 51.4 and 50.4mpg. The latter, benefiting from Stop & Start, produces 135 to 139g/km and achieves between 55.4 and 54.3mpg. The 120 and 148bhp 2.0-litre turbodiesels are recommended for vans carrying higher payloads, thanks to their higher torque – 340 and 370Nm respectively. Both use six-speed manual transmissions and, equipped with Stop & Start, produces 139 and 143g/km of CO2, with fuel economy from 49.6 to 47.9mpg. The 178bhp (132kW) version of the 2.5-litre engine is the most powerful in the range, fitted as standard with a six-speed automatic transmission and producing 400Nm of toque. It features Stop & Start and has combined cycle CO2 emissions of between 151 and 155g/km and fuel economy from 49.6 to 47.9mpg. All powertrains meet Euro 6 emissions standards and are equipped with selective catalytic reduction to reduce the amount of NOx released into the atmosphere. A 22.5-litre tank of AdBlue ensures the system will work to its optimum capability for 15,000km (about 9,300 miles). The tank is easy to refill, via a filler inlet on the B-pillar, accessible when the driver’s door is open. Low cost of ownership is supported by service intervals of 25,000 miles or every two years, according to usage.